Some sort of huntsman spider stands over a another huntsman that fell prey to it. 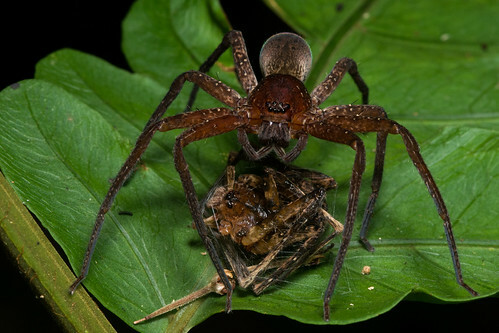 This is impressive as it appears that the prey spider had been almost the same size as the spider which fed upon it, so perhaps the tables could easily have been turned. There are an incredible amount of spiders in the jungle, this becomes apparent when walking through the jungle at night with a headlamp, it is possible to see hundreds of tiny little eyes reflecting back at you from all over.